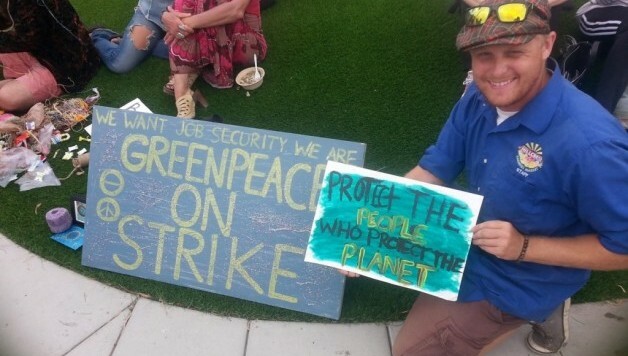 In San Diego and Sacramento, Greenpeace canvassers have gone on strike for job security and a union. The strike, which began on August 5, now includes the majority of both San Diego and Sacramento Frontline programs, Greenpeace’s in-house fundraising program. The striking workers demand increased job security through reforming the quota system, and a union. Greenpeace is a global environmental justice organization that is funded primarily through supporter contributions. Despite their stance on environmental justice, their fundraising canvassers have little job security through harsh weekly quotas. Rather than evaluation based on overall performance, any worker can be fired for missing 2-3 consecutive weekly quota periods. Support Greenpeace workers by signing this petition, and donating to their strike fund. Socialist Alternative supports the striking canvassers and endorses the call on Greenpeace management to reform the quota system to increase job security, and to support the unionization of Greenpeace workers. A victory for Greenpeace workers can help inspire other canvassing workers across the country to demand fair working conditions.